In 1925, J.H. Chambers constructed a bridge to transport logs across the Coast Fork Willamette River to his sawmill on the east side of the bridge. The bridge was operational until 1951, when the bridge was sold for scrap. 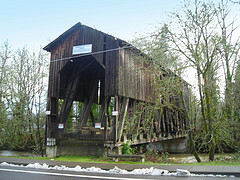 The bridge’s full ownership was secured by the City of Cottage Grove and is listed on the National Historic Register. The Chambers Railroad Bridge is the only remaining covered Railroad Bridge in Oregon and is believed to be one of only two remaining west of the Mississippi River. After a storm in January of 2010, there was an emergency declared due to the bridge being in danger of imminent collapse. There was significant damage and decay and the bridge was leaning to the upper river side. There was a concern that if restoration work didn’t happen immediately, Oregon’s only remaining covered railroad bridge would be lost forever. In February 2010, the Cottage Grove City Council declared it an emergency and authorized the immediate dismantling of the bridge. Due to the re-construction of the bridge being an urgent matter, Portland Bolt was contact directly by the contractor hired to do the work in regards to the bolts required. Being that this was an Oregon Department of Transportation job, all of the bolts and fasteners needed to be 100% melted and manufactured in the USA. The bolts required for this job consisted of 1-1/4″ x 23-1/2 foot long rods as well as over 20 different sizes of square head bolts, square head lag bolts, carriage bolts and 90 degree bent anchor bolts, all needing to be 100% domestically made and hot-dip galvanized. It is common for square head bolts to be used on these types of structures due to owners wanting to keep the rustic, traditional look, however trying to find domestic square head bolts in lengths ranging up to 46″ in length, as well as hot-dip galvanized is not an easy task. Portland bolt has the manufacturing capabilities to custom make every item required for this job in-house, which made the job very easy for the contractor doing the work. Also, since Oregon Department of Transportation inspectors are inspecting bolts at Portland Bolt on a daily basis, the fasteners were packaged, tagged and ready for installation as soon as the bolts arrived at the job site.